Mouvex A Series eccentric disc pumps, known for their reliability, are now available in ductile iron construction – a critical upgrade as more companies in the oil and gas industry are integrating ductile iron systems into their processes. Additional upgrades to Mouvex’s A Series pumps includes the implementation of ISO PN16/ANSI 150 flanges while offering both Mouvex or standardized mechanical seals, which helps expedite installations regardless of location. A Series pumps also doubled its maximum differential pressure from 5 bar (72 psi) to 10 bar (145 psi), enabling it to be used in the safe transfer of viscous, non-lubricating, volatile or delicate fluids in a variety of oil and gas applications. Mouvex A Series positive displacement pumps have maximum speeds to 600 rpm, maximum flow rates to 55 m3/h (242 gpm), as well as suction and discharge ports from 1-1/2 through 4 inches in size. 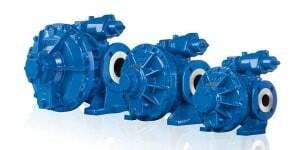 These pumps enable product transfer up to 80 degrees C (176 degrees F), and feature self-priming and run-dry capabilities while maintaining constant flow rates regardless of changes in viscosity and pressure. Mouvex A Series pumps also maintain their initial performance over time and are ATEX-certified for use in potentially dangerous environments with the ability to run-dry for up to six minutes.